Today we ran into a friend whose sister-in-law had given birth to a baby three days earlier. The baby wasn’t breathing initially but with some assistance seemed to be fine. However, a few hours after delivery he had a seizure. The baby was rushed to the Neonatal ICU and the family was left with lots of questions and very few answers. She asked if we’d pray for them. As we drove away I thought of a visiting pediatrician that we’d gotten to know, Dr. Prudy, who has been working at ELWA. During her two weeks in Liberia she hadn’t seen any of the other medical facilities in Monrovia. Thinking that she might enjoy a change of scenery I called and asked if she’d like to come examine this infant. She was eager to see the JFK Hospital - so after getting permission from the Head Pediatrician at JFK, Kreig and I took Dr. Prudy to assess the baby and tour the hospital. As we arrived at the hospital several of the nurses recognized me from when from when Koliwo had been a patient. One nurse, Audrey, grabbed my arm and said, “Oh, I was so hoping you’d come back. There is a little boy that needs your help.” He drank Caustic Soda – a clear odorless chemical that causes terrible burning when in contact with skin. It is made here as a cleaning solution but stored in containers that often store water. So unfortunately, it is mistaken for water and drunk – of course they realize the error once it is too late and the damage has been done. Wow, I was in shock – a child that had caused all the staff to cry. There must be something very special about him. I am amazed at the sadness and hopelessness that the doctors and nurses encounter on a daily basis. They are so limited by the lack of resources. It’s not that they don’t know what they should do – it’s just they don’t often have the things they need to help people the way they’d like. I promised Audrey that I would meet the child – if she arranged it. Of course I am limited in what I can do – but I can make some phone calls to the excellent surgeons that I have met over the last several months to see if they can help. Although she doesn’t say it . . . I know that she’s hoping I’ll be able to pay for procedures to save the life of this child. I hesitate briefly . . . thinking, “can I afford this - but I can’t allow that to stop me at this point, can I? After all we are talking about human life – can I put a price tag on that?” Now I will wait for a call from Audrey – if that happens I’ll have to trust that God will give us the wisdom and resources to know how to help this child. As I leave Audrey in the hall I walk towards the neonatal intensive care unit (NICU). It is a small room that has a sign on the door saying, “Restricted Area – Enter with Permission Only.” I called the JFK pediatrician again and she asks me to give the phone to the nurse in charge. 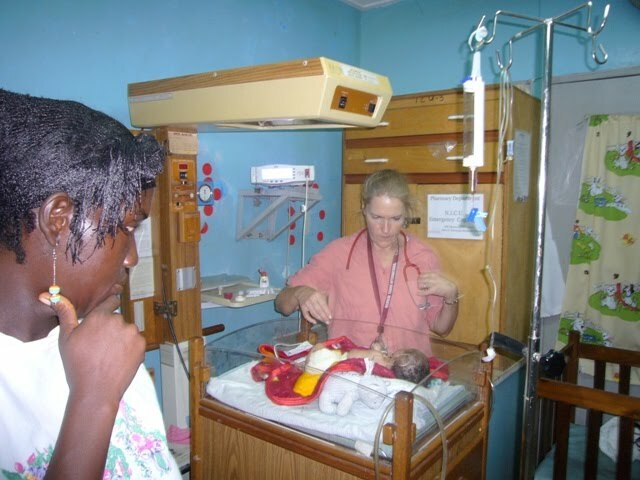 She explains that she is busy in the pediatric ward and asks the nurse to allow Dr. Prudy to examine the baby. The nurse hands her the chart – a stack of stapled papers with hand scrolled notes. The mother looks on with concern as her baby breaths very rapidly. Dr. Prudy begins to ask questions but the nurse has just come on shift and doesn’t have a lot of answers. She is concerned that the baby is so big and it looks like maybe it was “overdue” and had been losing weight towards the end of the pregnancy. Maybe the mom had gestational diabetes and the baby was born hypoglycemic – then had a seizure. But we will never know because no lab work has been documented – so we assume it wasn’t done. By the end of her exam, Dr. Prudy looks concerned but also realizes that they are doing the best they can for this baby given the limited resources they have. The information she would like to gather is not available here – there is no CT Scan in Liberia and the reagents to process many blood tests are finished. Before we leave we pray for the baby and the medical staff caring for him. We know that the life of this baby is really in God’s hands. Next we head to the Pediatric Ward to see the facility. 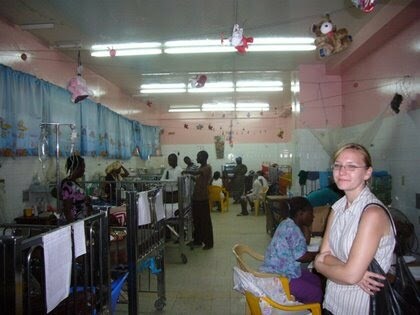 There are two nurses taking care of 20 very sick children. The nurses explain that most of the children are suffering from complications of malaria – anemia, high fevers and dehydration. The room is large and long with lots of people - it is during visiting hours - many family members have come to see the children. The nurse pointed to another room that she says has two patients. This room is usually reserved for children that come in with tetanus – stiff neck and then a locked jaw. Dr. Prudy asks if this is more common because they put leaves over the umbilical cord at birth. The nurses say possibly . . . but also explains that many parents don’t clean a cut with soap and water, rather they make a “mud paste” to cover the fresh wound. If there are tetanus spores in that soil then the neurotoxin goes straight into the child's blood stream and they start to experience symptoms within a day or two. But the most tragic cases are the newborn babies that get tetanus because the umbilical cord is cut and tied with a dirty blade. Amazingly, about 50% of these infants and children survive. No comments yet... be the first to write one.